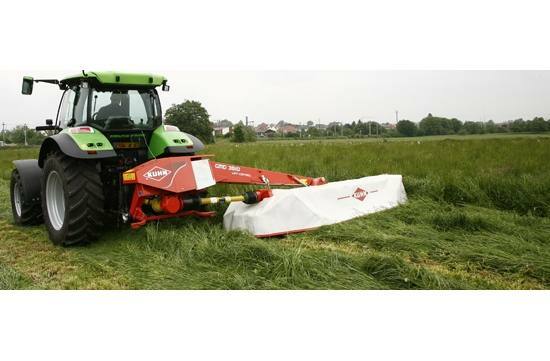 When an operation requires wide working widths with a mounted mower, the 10 Series horizontal fold machines are the answer. With an industry-leading suspension system to significantly limit uptake, combined with horizontal folding for increased safety and flexibility, the 10 Series can increase your bottom line. An exclusive “lubed-for-life" cutterbar reduces maintenance requirements and provides a more efficient, cleaner cut at varied speeds, especially in difficult conditions. The patented Lift-Control® system improves suspension, further enhancing performance. These models also feature a non-stop auto-reset safety breakaway, and externally removable disc bearing stations with heavy-duty gears and bearings for convenient, reliable operation and quick service. Hydraulic-folding, horizontal rear transport provides low and narrow positioning with effective suspension that reduces load and shock on the tractor.